To the north of the main island lies Fiji’s second and third largest islands – Vanua Levu and Tavenuni. Vanua Levu island is approximately 50km wide by 180km long and is divided horizontally by a rugged mountain range. The first known European to sight Vanaua Levu was the Dutch navigator, Abel Tasman, in 1643. In 1789 Captain William Bligh passed the island after being set adrift in a lifeboat after the mutiny on the Bounty with the area of water below Vanua Levu now being known as Bligh Water. The island has two main towns – Labasa in the north and Savusavu in the south. Savusavu is positioned on an extinct volcanic crater and is a natural paradise – a big, calm bay teeming with fish, fringed by mountains and old copra plantations and the area is renowned for its hot geothermal springs, marina, pearl farms and spectacular dive sites as the nutrient rich waters provide the perfect environment for growing cultured pearls and a huge variety of marine life. The town was originally established as a centre for sailing ships trading in beche-de-mer and copra and has one main street that is a hub of activity with steam from the geothermal activity venting from the rocky foreshore, and a black sand beach where many local women do their cooking. Lebasa is the largest town on Vanua Levu and lies on a delta formed by three rivers; the Wailevu, the Labasa and the Qawa, providing a great environment for the local agriculture industry, of which sugar cane is the main crop. Labasa markets are quite large and offer a range of food, spices, fish, poultry, goat and local products. Taveuni Island is Fiji’s third largest island, 42km long and 15km wide and has the distinction of lying on the 180th Meridian (the International Dateline), 12 hours east and 12 hours west of Greenwich. Waiyevo, is the government administrative centre for the province and the site of the famous marker for the 180th Meridian. There is a 24 hour difference in time between the two sides of the line. The Eastern Hemisphere, west of the dateline, being a day later and the Western Hemisphere, east of the line, being a day earlier. Today the official dateline has been bent for convenience with all of Fiji placed west of the line. Fiji is GMT +12 hours for example 1200 noon in Fiji is 1600 hours in Los Angeles the day before. Taveuni is known locally as the Garden Island due to its lush rainforest, an array of rare flora and fauna, waterfalls and a legendary mountain lake. The surrounding reefs are known to have some of the best dive sites in the world. The island is excellent for bird-watching with over 100 species of birds., mostly due to the fact the island is free of the mongoose that have devastated bird populations on other islands. Wairiki Village is the catholic centre for Taveuni where a major percentage of people belong to the church. All important Catholic events are held in Wairiki and at Easter its population explodes and church services are held on the school sports ground to accommodate all the faithful. As part of the Easter celebrations a ‘stations of the cross’ reenactment is conducted along the rocky path heading uphill behind the mission. This culminates in a service at the massive Wairiki cross, for all the worshippers who made the trek to the top. Naselesele lies on the northern tip of Taveuni and is the chiefly village growing yaqona and dalo which is exported around the world. From Naselesele you can travel overland to the spectacular Bouma Falls and pool. There is a hidden cave behind the waterfall and during the rainy season these falls can be heard from miles away.The Matei Airport lies beside the village with a few resorts and farming estates belonging to overseas investors. 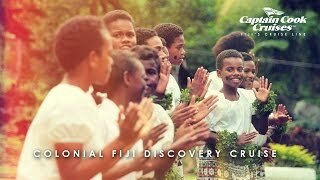 Captain Cook Cruises offers two cruises to the remote north of Fiji, The Colonial Cruise and 4 Cultures Cruise both of which visit Vanua Levu and Taveuni. Explore this beautiful region aboard the M.V. Reef Endeavour with itineraries that offer plenty of opportunities to experience the local culture and natural wonders.